A VISIT FROM THE GOON SQUAD A brilliantly entertaining novel about memory, time, art and how humans connect at every level. LOOK AT ME The stunningly well praised second novel raises tantalizing questions about identity and reality in contemporary Western culture. EMERALD CITY Eleven masterful stories, seamless evocations of self-discovery. 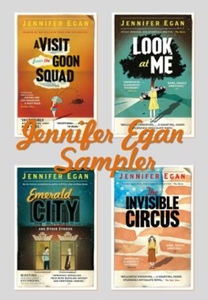 THE INVISIBLE CIRCUS This spellbinding novel introduces Egan's remarkable ability to tie suspense with deeply insightful characters and the nuances of emotion.